Bees aren’t a very popular insect. For some homeowners, these yellow and black creatures cause nothing but frustration and panic. In fact, if you’re allergic to their sting, the presence of a bee could even mean real danger. Yet bees are a crucial part of our ecosystem. If they didn’t exist, humans probably wouldn’t, either. In the U.S. alone, bees contribute to about $15 billion per year in crop value; without them, we’d be unable to sustain our agriculture. Yet, worryingly, the government predicts that bees are dying out at a drastic rate. Of course, none of this means you want an infestation of bees in your home or elsewhere on your property. But you should hire someone to remove and relocate unwanted colonies rather than simply exterminate them. According to experts, whether you like bees or not, you need them in your world. These unique insects are responsible for much of the food on your table because they perform a vital agricultural task: pollination. Around 90% of all plant species today rely on pollination to reproduce. Pollinators like bees help plants to produce fruit by transporting pollen between flowers. That’s why these creatures contribute more than $217 billion to the global economy, $24 billion of that in the U.S. The global cost of the declining bee population, from an economic perspective, is around $5.7 billion per year. The more bees we lose, the more the planet suffers. In the U.S., around 25% of the honey bee population has died out since 1990. Honey bees are some of the most important pollinators in the U.S., responsible for helping more than 100 crops grow across North America. Of course, bees don’t just pollinate crops. These special insects also support the growth of native plants, providing attractive habitats for birds and other insects, and making the world a more beautiful place. Honey bees are also the only insect that produces a food that humans consume: honey. Honey has many potential health benefits, thanks to its natural antibacterial properties. In simple terms, bees not only keep much of the planet’s population fed, clothed, and protected, but they also make the world a sweeter place to live in, too. Fortunately, there are efforts underway to help save bees, such as the $8 million in incentives provided by the Department of Agriculture to farmers who build habitats for honeybees. However, it’s also up to you as a homeowner to do your part. You don’t have to put up with a housing a colony on your property. All you need to do is make sure that you choose the right team to remove and relocate your bees, instead of exterminating them. At Adios Pest Control, we have the special skills required to safely transport bees to a new home. We simply schedule a hive relocation for a time that’s suitable for you, and locate the nest using a range of careful, tested methods. Once the nest has been found, we use a vacuum or “bee box” to collect the bees and transfer them into a safe habitat away from your home, before cleaning the area and repairing any structural damage. 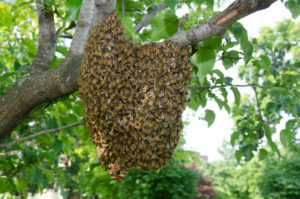 It can be tempting to take a drastic response to the presence of a hive near your home. However, it’s important to remember that bees help keep our ecosystem alive. These creatures need our help if they’re going to continue putting food on our tables, brightening our environment, and powering the economy. Get in touch with Adios Pest Control to deal with your bee problem today. © 2019, Adios Pest Control, Inc. All Rights Reserved.